What do I mean by San Diego Local SEO? You have probably heard of Technical SEO, On Page SEO and Off Page SEO. Over the last few years a new type of SEO has become very important, Local SEO. Local SEO is all the best practices associated with ranking your business locally. Google has been updating its algorithm to give more importance to local search. It initially prioritized local with an update in July 2014 referred to as Pigeon. Then once again in September 2016 they placed additional importance on local results with an algorithm update known as Possum. Historically it has been difficult for businesses outside of physical city limits to show up for a query for a certain city. For example, if a user searches “San Diego Dentist” a Dentist office located in Del Mar would have a hard time showing up. Sure, Del Mar is part of San Diego county, but it is not within San Diego City limits. You may have noticed Yelp showing up more frequently. In fact, in many cases Yelp takes up several of the Organic listings. It’s not just Yelp though, other directories like TripAdvisor, Angie’s List, Homeadvisor, Thumbtack, Avvo, Super Lawyers and A Place For Mom are also showing up more often in the Organic Listings. This impacted businesses in the same industry sharing office space even if they had different names and phone numbers. Of course it also wiped out anyone getting tricky and trying to get the same business listed twice to take up more real estate on the Search Engine Results Page. Google refers to your business being listed on directories as a citation. When you have an abundance of accurate and consistent citations it materially helps your local SEO presence. Google looks for consistency across these directories in NAP, which is the industry acronym for Name, Address and Phone Number. When it comes to listing your business on directories you have the option of doing the work manually or partnering with a company that specializes in citation management. A handful of companies offer this service like Yext, Moz Local and Synup. Both options have pros and cons. If you decide to do the work yourself, it will be time consuming and you will need to make sure you have a process to ensure organization since you will not be able to verify every listing in one sitting. Some directories like Bing Places for Business will verify your business by sending a postcard in the mail. YP will call the business phone to verify and DexMedia will send an email. Verifying listings on your own is time consuming but comes with the benefits of owning the listing, controlling exactly what shows up and of course it is without the financial burden of a monthly or yearly recurring cost. On the other side of the coin tools like Yext are extremely convenient. You submit information one time in a centralized software and Yext syndicates your NAP to dozens of directories. It is especially convenient if your business has several locations all with varying addresses and phone numbers. If you’re wondering what we do at Rocket Pilots, we submit the information manually on behalf of our clients. This way we are certain what was submitted and we avoid the client having to pay for the free listings every month or year. For sure they main citation is your google plus listing. You will need to create a Google My Business account in order to manage your Google + account. Creating a Google My Business and Google + account is very easy. You’ll need to add a profile picture and a cover photo, write a tagline, choose a primary business category and add additional business categories. You will of course add the basics about the business like name, address, phone number, website and hours of operation. Upload a few pics and add a few social postings and you will be all set. It’s a easy process but Goolge + is also the cornerstone to local SEO so it should not be overlooked. Google will need to ensure you own the business. In order to verify the business they will mail you a postcard with a 4 digit pin. After you receive the pin and postcard log back in and type in the 4 digit pin. Customers can also leave reviews on your Google Plus page which can show up on the Search Engine Results Page. In fact, listings with several positive Google reviews tend to have higher Organic Click Through Rates. I should add a quick warning about using Schema to mark up Google Reviews. Historically, Google’s guidelines allowed us to mark up reviews from 3rd parties. A 3rd party in this context represents a review that did not originate from your website. So think Yelp, Angie’s List and Google +. Recently, Google updated their guidelines. Now, only reviews produced directly by your site can have the Schema local review markup. After thoroughly building out your Google My Business account add the Rel Publisher Tag to your website. This tag connects your Google + page to your site and enables the knowledge graph to show on the Search Engine Results Page for branded searches. Embed a Google Map on your website. The process is very straightforward. Implement Schema on your website with local information like the address and phone number. Schema markup is code you place on your site to enable Search Engines to return more valuable information to users. Schema is a centralized library of code created and standardized in a collaborative project between Google, Yahoo and Microsoft. I often get blank stares when I am talking to small businesses owners about Schema because it falls under Technical SEO. But, don’t be intimidated, there are plenty of tools to make the process of marking up your site, creating the code and checking the code a seamless process. 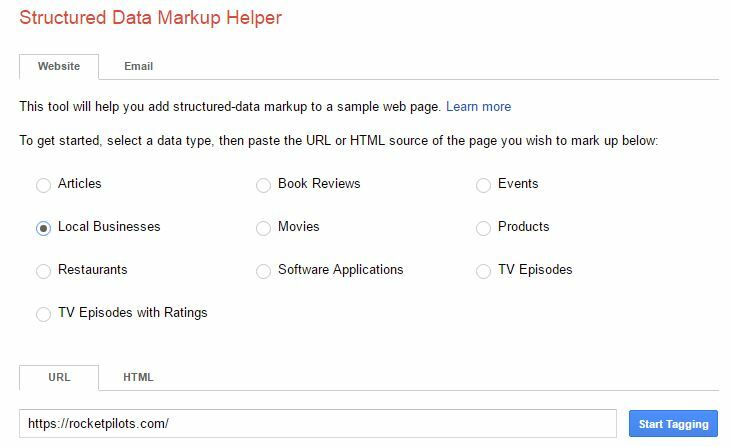 You can start with the Structured Data Markup Helper. Select the data type, input the url and start tagging. Then download the HTML code and install on your site or simply email the code to your webmaster for installation. Lastly, you will want to use Google’s Structured Data Testing Tool to Fetch the URL and ensure your code was properly installed. Now, that wasn’t so bad! Sometimes is easy to forgot the basics and focus on the complicated technical tasks. I probably don’t need to remind you that speed and mobile friendliness are huge ranking factors. In fact, mobile is so important that Google will be rolling out a “mobile-first index” sometime in 2017. So if your site is still slow or not mobile friendly, it’s time to get on it! Local reviews impact actual rankings, organic click through rates and influence the consumer during the buying journey. According to Moz’s 2017 Local Search Ranking Factors online reviews make up about 7-13% of how Google ranks a site. This should be motivation to ensure your customers are leaving reviews on directories relevant to your industry. This naturally brings up the conversation about Yelp. Yes, you absolutely want positive Yelp reviews. Unfortunately it’s a violation of Yelp’s policy to outright solicit reviews. Google on the other hand does allow you to solicit reviews on your Google + page. So, make sure you politely reach out to satisfied customers and ask for Google reviews. Not only will reviews impact your rankings but they can also show up on the Search Results Page. If you have more positive reviews than your competitors on the SERP, you increase the chance of beating your competitors out of the click. And since Organic CTR is also a ranking factor, the more often you beat out your competitors for the traffic, the more your site will move through the rankings. Remember earlier I mentioned directory listings are ranking more prominently on the SERP’s? This is a good opportunity to implement Barnacle SEO and leverage big brands SEO to drive traffic to your site. Barnacle SEO is the practice of leveraging other sites, often authority sites for your own marketing efforts. If you have a lot of Yelp reviews, and Yelp takes up a few places in the Search Engine Results Page, then you can actually benefit from Yelp’s prominent rankings. A user will conduct a search, click on a Yelp listing, hopefully notice your Yelp listing and end up on your site. I see so many business owners that are upset with Yelp that they fight the process. Trust me when I tell that Yelp is here to stay and they will continue to filter out reviews. I know it’s frustrating but don’t paddle upstream. Embrace Yelp and run damage control on your profile when you receive a negative review. Quickly provide a public response addressing the customer’s complaint. The community will notice your professionalism and commitment to reputation management. The same Barnacle SEO strategy applies to other review platforms. There may be a review platform specific to your industry that you can leverage for traffic. Include the city in your page’s H1 Tag. H1 stands for Heading 1 and is simply the heading for your webpage. Headers are created by a basic piece of HTML code. If you are using a Content Management System like WordPress, you typically can just tag a sentence through a pull down as paragraph, H1, H2 or H3 tag and you don’t actually have to write any code. Just to be clear Title Tags and H1 Tags are two different things. Title Tags show up on Google, Yahoo and Bing as the clickable headline for an Organic Listing. And a H1 Tag is the heading for a specific webpage. Here is an example of a title tag from Google for the search San Diego Brake Repair Shop. The blue text is the Title Tag. Include the city in a H2 Tag. If you have a relevant Subheading where you can naturally use “San Diego” you can wrap it in a H2 Tag. An H2 tag is similar to an H1 Tag but represents a subheading and is not the main heading. The HTML code changes from a 1 to a 2. As the top San Diego Brake Repair shop, we pride ourselves in high quality work. Offer your services Pro Bono in exchange for a link – For example, let’s say you are a Dentist. You could contact a local charity that is close to your heart and offer the staff free exams while only asking for a backlink in exchange. Think about how much you accomplish with this gesture. You do some good by providing your service free of charge, you meet a handful of prospective new patients for the future and you promote your local SEO by gaining an additional local backlink. It’s a huge win! Become a Sponsor – Identify a local organization in your community, become a sponsor and gain a link on their site. Most organizations that recruit sponsors have a dedicated area on their site where they add sponsors logos and thank them for contributions. The organization could be a group specific to your industry or simply a non profit working towards a good cause. Do your own local Public Relation outreach. If your company is doing something unique, don’t be shy, get the word out. Sit down one day with a cup of coffee and aggregate the contact information of every local news and media outlet. Craft a compelling message, share your story and you may end up getting picked up resulting in a link on their site. Spy on the competition – Sometimes the fastest route to a new link is to determine what your competitors have done and replicate the process. You can use a tool like Ahrefs to spy on your competitors backlink profiles and look for local link opportunities. Check out the sites that are linking to them and try to determine why. Was it a local directory you didn’t know about? Now, try to get yourself a link there as well! Leverage Local Influencers on Social Media – Spend some time looking through Twitter, Facebook, Instagram and Youtube. Look for an industry influencer that is not a competitor. Connect with them on Social Media and slowly build a relationship. Get noticed by liking their posts, retweeting their tweets and generally engaging with their content. Then politely ask them for a backlink. Maybe you have a piece of content that is relevant to one of their blog postings. Let them know you think your link would be a great supplement to their content and ask for the backlink. Local Broken Links – For this strategy you will want to identify local sites that blog about your industry. For example, let’s say you have a jet ski rental or boat rental company. Then you could identify sites that talk about visiting San Diego or San Diego travel sites. Look for a page that is relevant to the bays, oceans, things to do, watersports and look for broken links. You can use Broken Link Checker or Screaming Frog to check for broken links. The good part about this strategy is site owners hate broken links. If you identify a broken link they will be appreciative. And if you provide a solution with a high quality piece of content that is relevant to their page, you will almost certainly earn yourself a new local link. These San Diego Local SEO Strategies will improve your sites rankings and help generate more quality local leads. Bookmark this blog post and use it as an instructional manual when you sit down to do the work. If you have already hired a San Diego SEO Company use this piece as a talking point to ensure they are implementing all of the best practices listed above. As always, if you would like to discuss the details of this post or you’re interested in a Free Consultation from me, don’t hesitate to check our SEO Services and contact me today. I look forward to hearing from you soon!